Our general contractors will see your job through, and our 30 years of experience means you can rest assured you have found the best in Cornelius, NC. 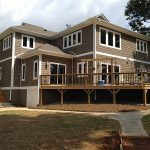 General Contractors in Cornelius – If you are like most homeowners in Cornelius, NC, there are a number of various upgrading and remodeling tasks you’ve probably considered having done to your home. You might want to upgrade the lighting, replace some flooring, put in new bathroom plumbing, or modernize the kitchen. You delay because the idea of hiring a plumber, electrician, handyman, remodeling company and a host of other individuals to do all these various tasks is daunting. Not only would you have to ferret out the best and most reputable in each category, but you’d then have to coordinate the work between them so they aren’t running into each other. Don’t worry– there is an easy answer to this dilemma. Our general contractors handle all those tasks for you, and they are experienced at coordinating everything perfectly. Our team at Chad Goodin Signature Homes is qualified in all aspects of home building and remodeling, making the process much less complicated for you. Besides saving you the hassle of locating individual contractors, our general contractors can handle any unexpected situations that might arise. For example, assume you hire a tile installation specialist to replace the old tile in your shower, and he comes across plumbing issues or rotted wood behind the tile. He won’t be able to complete his job and will tell you to go hire a plumber and carpenter to take care of the issue before he can get back to work. That won’t happen if we’re on the job, as we easily shift into any needed roles to get the job done. From start to finish, our general contractors will see your job through, and our 30 years of experience means you can rest assured you have found the best.